450,000 kids and parents listen to Fun Kids each week. 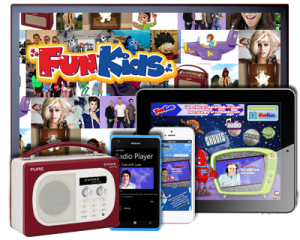 We broadcast on DAB Digital Radio nationwide, are available to listen to online worldwide and on the Fun Kids Radio App. Competitions are a key part of our Fun Kids campaigns, we currently generate over 10,000 competition entries each month and share opt-in data capture with our clients. The Fun Kids website has seen over 100% growth over the past 12 months. There’s also over 500,000 instances of listening (stream starts) each month. Collectively we have 3 Million YouTube views a month. Fun Kids is an iTunes partner which means we get enhanced promotion of our channels – which now number over 150, making us one of the largest providers in this space. Our podcasts, which are both audio and video, have over 200,000 downloads each month. Fun Kids is one of the most popular profiles on the PopJam mobile app. Over 137,000 children follow Fun Kids, interacting with our posts and suggesting questions when we interview top celebrities like LEGO Batman.